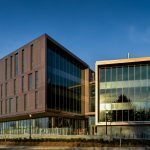 The goal for the John W. Olver Design Building at the University of Massachusetts Amherst was to create an innovative and inspired building that visibly demonstrates environmentally sensitive design. 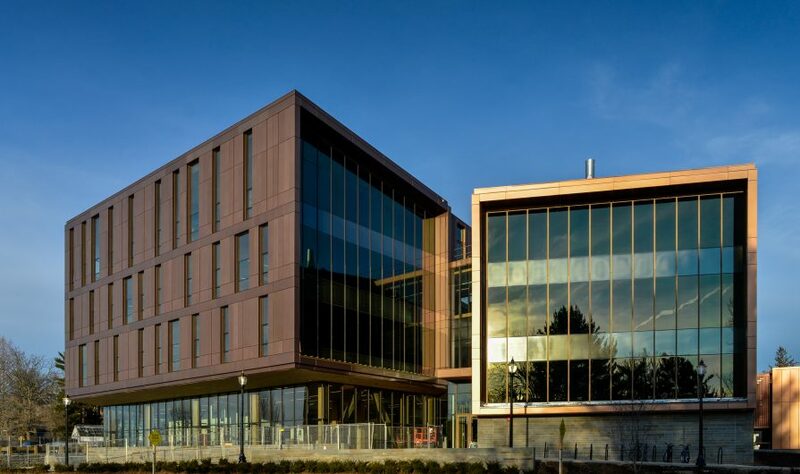 The result is one of the most advanced mass timber buildings in the United States; a four-story, 87,500-sq.ft. structure that exemplifies the university’s commitment to sustainability and, through generations of students who will learn within its walls, the future of the built environment. 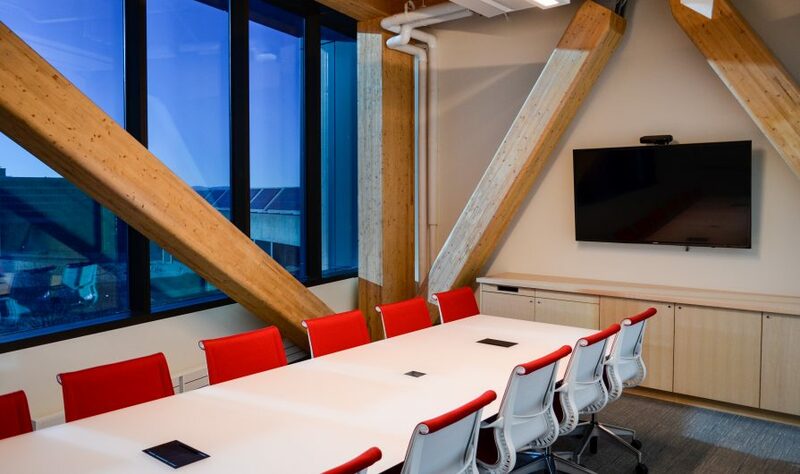 The Design Building sets a high bar for mass timber buildings in the U.S. with a glulam timber column-and-beam frame, glulam brace frame, cross-laminated timber (CLT) shear walls, timber-concrete composite floor system, and unconventional cantilevered forms. It is wrapped in an envelope of copper-colored anodized aluminum which, combined with vertical windows, echoes the wood structure by evoking the color and pattern of regional forests. Just as it unites three university departments, the Design Building serves as a bridge between the architectural styles of different campus buildings. 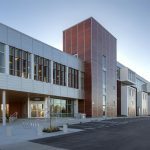 It is carefully sited on a steep slope at the main campus artery, rising from three stories on the east side of the building to four on the west. In this way, its massing connects the smaller structures of historic Stockbridge Way with the brick Fine Arts Center and modern concrete structures on campus. 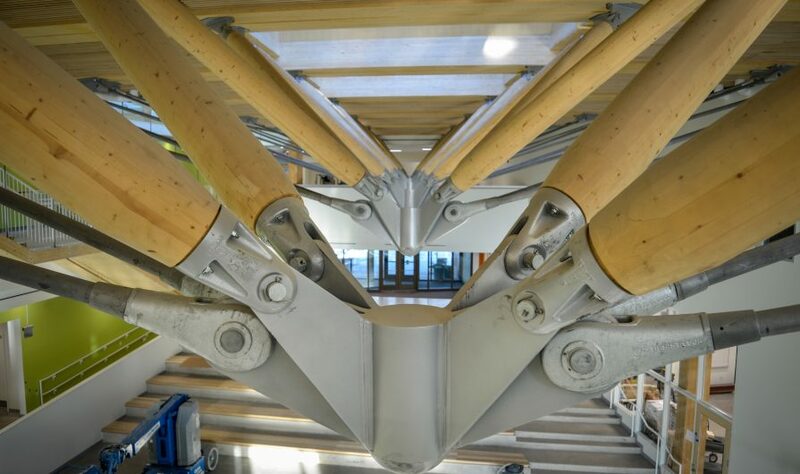 The steel design was more than half complete when the university decided on a wood structural system. However, knowing that a switch was possible, some smart design decisions were made early on, to select a structural grid that could accommodate either steel or mass timber, and paying close attention to floor-to-floor heights and overall building geometry. The team even created parallel schematic drawings of a mass timber building design. Intended to house 500 students and 50 faculty, the Design Building is organized around a two-story central atrium; a flexible gathering and event space with integrated tiered seating, movable partition boards, lounge seating and cafe. 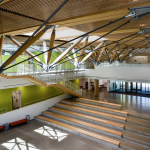 Dominated by the composite zipper truss roof structure, the atrium also features a three-story, folded CLT stair, hung from a single long-span truss with thin rods that give the impression it’s floating. Facilities used by all three academic departments surround the atrium in the building’s main volume. The first floor features exhibition and lecture space, laboratories, fabrication and materials testing shops, dining and classroom space, while the second and third include studios, classrooms and offices, and the smaller fourth floor contains studios. Above the atrium is a green roof that functions as a public courtyard and outdoor learning space for students studying urban landscapes. A curtain wall system exposes much of the building’s first floor, including the timber structural system and atrium space, inviting interaction with passersby. The second story cantilevers several feet beyond the first, and the second, third and fourth stories are clad with a panelized rainscreen system. The Design Building is Type IV Construction with a limited number of unprotected steel transfer beams in the two cantilevers and elements of the courtyard truss. Type IV Construction allows the use of exposed, solid or laminated wood members such as CLT, glulam and wood decking if certain provisions are met. For example, per IBC 2009 Section 602.4, minimum timber sizes must be used, concealed spaces are not permitted, and exterior walls must be of non-combustible materials or fire retardant-treated wood. 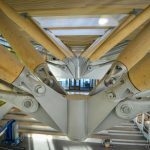 The structural gravity framing system includes glulam beams and columns supporting the timber-concrete composite floor system and CLT roof decking. Other than CLT shaft walls, walls are non-load bearing, cold-formed steel walls with standard gypsum finishes. Common glulam floor beam sizes are 14-1/4 inches wide x 15 inches or 16-1/2 inches deep. Columns are 14-1/4 inches wide by 22-1/2 inches to 25-1/2 inches deep. 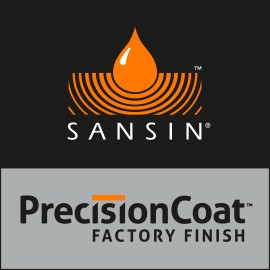 Glulam members were sealed with standard factory clear-coat finishes, and members in areas of higher traffic were given an extra coating in the field. Most of the glulam members are black spruce. The roof assembly is made from seven-ply CLT panels, with rigid insulation and sheet membrane on the exterior. Panel-to-panel connections are surface splines with plywood and self-tapping wood screws. Typical panel-to-beam and beam-to-column connections included a variety of self-tapping wood screws, which are common on modern mass timber projects, and concealed beam hangers. In their final condition, the steel hangers are protected from fire exposure by a minimum thickness of wood. Completed in January 2017, the building is now home to a bustling education community. 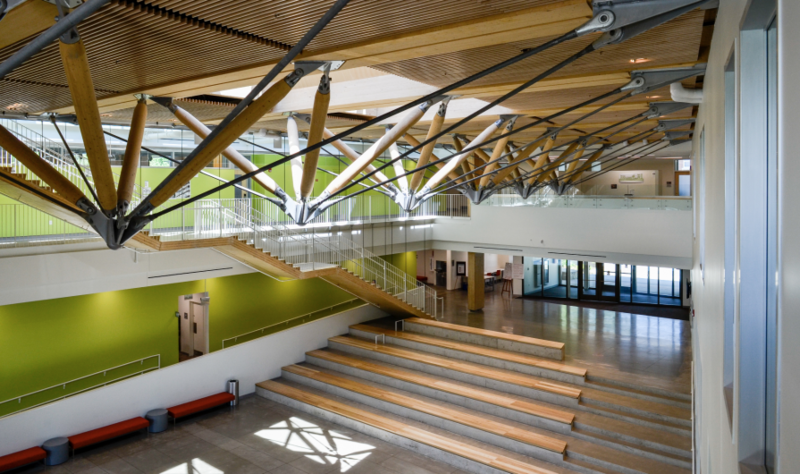 Its innovative mass timber systems are an inspiration for students, practicing design professionals, and every passerby drawn by the extraordinary sight of the zipper truss within. It is also, in many ways, the embodiment of an optimistic future. By inspiring designers and their projects, for example, there is a good chance that the Design Building will lead to increased manufacturing of mass timber products in the eastern U.S. Attuned to this potential, the BCT program is already researching the use of local hemlock for CLT. 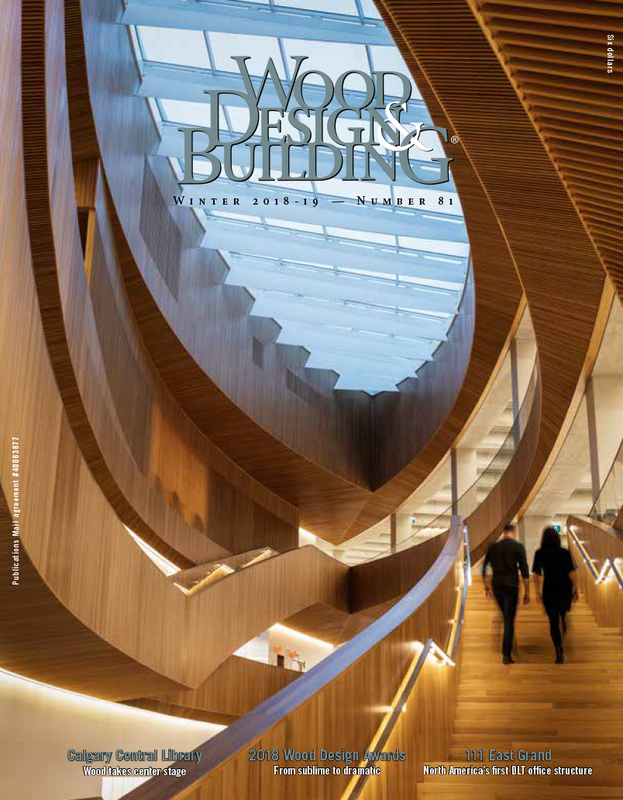 This article is excerpted from a case study published by WoodWorks – Wood Products Council (www.woodworks.org). WoodWorks provides free project assistance as well as education and resources related to the design of commercial and multi-family buildings in the U.S. To read the full case study, visit www.woodworks.org/publications-media/case-studies.